Notice the necrotic lesions from this Corum cherry tree. Photo by Iain MacSwann, 1975. A chlorotic mottling develops on leaves which may also show variable chlorotic rings and patterns, ultimately taking on a late-summer yellow. OSU Extension Plant Pathology Slide Collection, 1990. Sweetheart cherries are also susceptible to Necrotic rusty mottle. Cause Uncharacterized graft-transmissible pathogen(s), presumed to be viruses, that can spread by infected bud wood or graft wood. The viruses involved with these diseases are related but different. 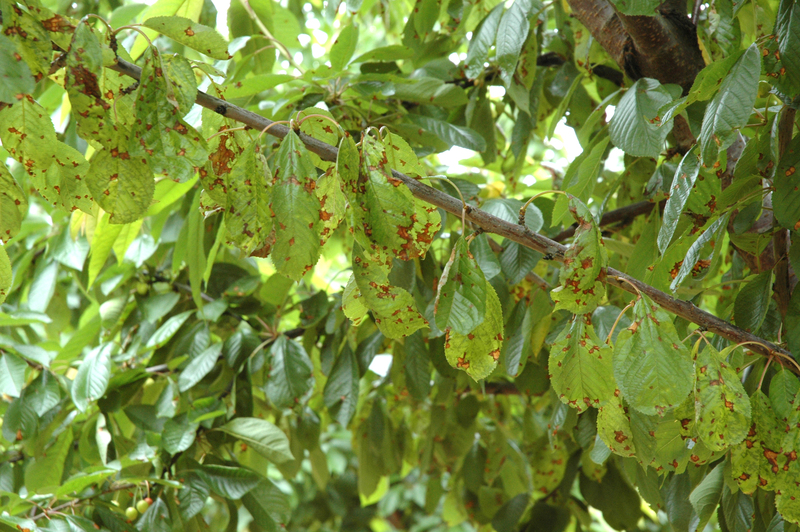 Cherry necrotic rusty mottle virus is associated with necrotic rusty mottle disease, Lambert mottle, cherry bark blister and Frogmore virus canker. 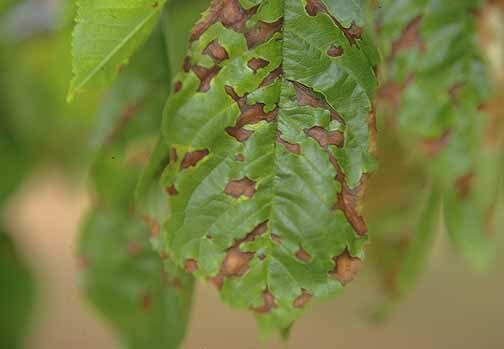 Cherry rusty mottle virus is associated with mild rusty mottle and rusty mottle. These diseases spread slowly in orchards from tree to tree, but the vector is not known. They are not common problems, but they do occur in all Pacific Northwest cherry production areas. In the orchards where Rusty mottle disease occurs, usually a large number of trees are affected. It occurs in all sweet cherry cultivars and Portuguese Laurel (Prunus lusitanica). The cultivars Lambert and Corum are very susceptible to necrotic rusty mottle. Symptoms Leaf symptoms can be highly variable and dependent on climatic conditions, virus isolate, and cultivar. Cool springs can result in more severe symptoms. Necrotic Rusty Mottle - Buds on terminal shoots fail to open or swell and eventually die. Other leaves and flower buds develop irregularly and late. May get large necrotic spots on leaves in mid-spring. 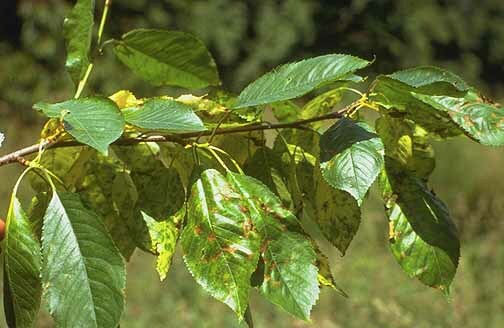 Yellowish interveinal mottle of older leaves in early summer followed by numerous purplish or chocolate spots, later becoming brownish. These irregular spots may partially separate at the margin from the rest of the leaf, giving the leaf a torn, ragged appearance. Twigs and larger branches sometimes die. The number of fruit spurs may be reduced and the crop subsequently reduced. Trees usually die in 1 or 2 years. Rusty Mottle - In early spring, infected trees show no foliage symptoms. About midway between blossom and harvest, a chlorotic mottling develops on older leaves. Soon much of the foliage shows variable chlorotic rings and patterns, ultimately taking on a late-summer yellow and red coloration. Two to 3 weeks before harvest, some of the more brightly colored and severely infected foliage drops. Gradually, mottling becomes more pronounced, turning yellowish brown and giving a general rust appearance to foliage. The disease's effect on fruit apparently depends on the severity of foliage symptoms and the amount of leaf drop before harvest. Removing trees with necrotic rusty mottle as soon as noticed has significantly reduced the disease's spread. Removal of diseased trees with rusty mottle when they are infected to the point they no longer can produce profitable crops. When a large number of trees are affected, consider orchard removal. Propagation material for new trees should be from certified virus-tested (and found to be free of all known viruses) bud wood only. References Villamor, D.E.V., and Eastwell, K.C. 2013. Viruses associated with rusty mottle and twisted leaf diseases of sweet cherry are distinct species. Phytopathology 103:1287-1295.